These are perilous times for Americans who need access to the legal system. Too many lawyers blatantly abuse power and trust, engage in reckless ethical misconduct, grossly unjust billing practices, and dishonesty disguised as client protection. All this has undermined the credibility of lawyers and the authority of the legal system. In the court of public opinion, many lawyers these days are guiltier than the criminals or giant corporations they defend. Is the public right? In this eye-opening, incisive book, Richard Zitrin and Carol Langford, two practicing lawyers and distinguished law professors, shine a penetrating light on the question everyone is asking: Why do lawyers behave the way they do? All across the country, lawyers view certain behavior as "ethical" while average citizens judge that same conduct "immoral." Now, with expert analysis of actual cases ranging from murder to class action suits, Zitrin and Langford investigate lawyers' behavior and its impact on our legal system. The result is a stunningly clear-eyed exploration of law as it is practiced in America today--and a cogent, groundbreaking program for legal reform. Richard M. Zitrin, a partner in the San Francisco firm of Zitrin & Mastromonaco, LLP, is an adjunct professor of law at the University of San Francisco, where he serves as coordinator of the legal ethics seminar curriculum and teaches a seminar in legal ethics and the practice of law. Zitrin also teaches trial practice at USF and legal ethics at the University of California, Hastings College of the Law. He was a member of the State Bar of California's Committee on Professional Responsibility and Conduct from 1990 to 1996 and served as its chair in 1994-95. Carol Langford is principal of the law office of Carol M. Langford in Walnut Creek, California, and a teacher of legal ethics at the University of San Francisco School of Law and at UC Hastings. She has also taught at UC Berkeley. She was a member of the State Bar of California's Committee on Professional Responsibility and Conduct from 1991 to 1997 and served as its chair in 1995-96. "A fascinating book for lawyers, law students, and anyone who is or might be a client . 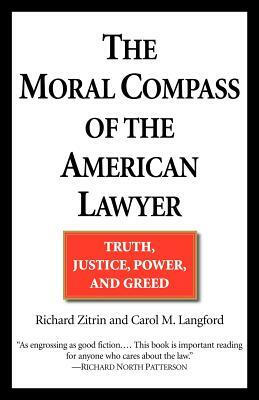 . . Zitrin and Langford use a series of cautionary tales for lawyers to engage the reader in the most important ethical dilemmas that lawyers face." "As engrossing as good fiction . . . This book is important reading for anyone who cares about the law."